Tanglewood-Hillsdale Community Association’s Neighbourhood Watch reminds current and new residents that we live is a cohesive neighbourhood that has a pathway circuit through the west and central part of our neighbourhood, taking you through the Park near our Community Centre. 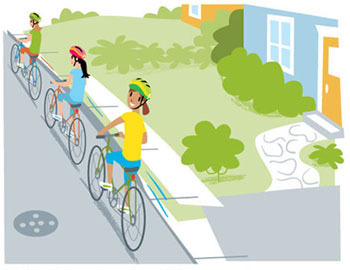 While enjoy your trips on your bike, respect those who use pathways for walking or roller blading. Always remain aware of your surroundings. The City of Ottawa released a new cycling map at the end of 2011. A copy can be bought for $2 at City Client Services Centres. Cyclists under the age of eighteen years are required by law to wear a helmet while operating a bicycle, and the chinstrap of the helmet must be securely fastened under the chin. Over eighteen year olds are also encouraged to use a helmet. Be a desirable role model. Cyclists who are asked to stop by the police should expect to provide your name and address. Dress brightly to be seen. Weekly check your tire pressure and pump your tires to the recommended pressure (the number is embossed on the tire sidewall). Check your front and rear brakes to ensure you can quickly and fully stop. Ride about 1 metre from the curb in a straight line; look well ahead and avoid hazards such as potholes, sewer grates and debris. Never assume parked cars are empty. Or that the person exiting the vehicle will have checked to ensure it was safe to do so. Shoulder check and signal before turning or changing lanes. Night riders should have a white light to the front and a red light or reflector to the rear. As the weather cools, wear gloves. Notice everything that goes on near you and particularly in front of you such as pavement cracks. The earlier you notice a possible problem, the greater chance you have of dealing with it. Listen to your instincts. Something that doesn’t look or seem right will probably cause a problem – so if you notice something like this, move yourself away from it as quickly as possible. Be vigilant. When turning at intersections be careful; most collisions occur at intersections.